Over the past six chapters, you've learned how to diagram two of the four verb types. You can do this! The answers are at the bottom of the page. 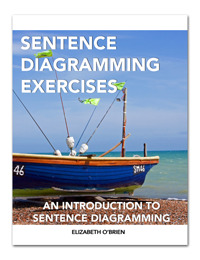 * You can also get your hands on the 120-page Sentence Diagramming Exercises book with all 11 chapters of instructions, exercises, and answer keys. Use it to learn grammar and have fun! Transitive passive verbs are another kind of action verb. In all of the verb types that you have diagrammed so far, the subject has performed the action. In passive verbs, the subject receives the action! Candle, the subject of the sentence, is receiving the action. It is being lit. Notice that we don't know who lit the candle. Many times, the doer of a passive sentence will be in a prepositional phrase. The candle was lit by Joe. Now we know who lit the candle. The doer of the action, Joe, is found in the prepositional phrase, by Joe. Notice also that the verbs in passive sentences always have a helping verb was and the past participle form of the main verb (lit). TRANSitive passive verbs TRANSfer their action to the subject of the sentence. The ball was kicked by the baby. Directions: Diagram the following sentences. 1. The book was written by Victor Hugo. 2. The victory was celebrated by the winners. 3. The plant in the corner was watered by the housekeeper. 4. My car was stolen yesterday! 5. Talkative children are scolded by the principal. Linking verbs, the fourth and final verb type, link the subject to either a noun that renames it or an adjective that describes it. Was is a linking verb connecting the subject, candle, with the adjective bright. Bright describes the candle. Mrs. Johnson is my teacher. Is is a linking verb connecting the subject, Mrs. Johnson, with the noun teacher. Teacher renames Mrs. Johnson. There are only 13 linking verbs. See them here. The baby is cute. The baby is a boy. 1. I will be a great musician. 2. Mmm! The chili smells absolutely delicious! 3. My dad became very happy at Disneyland. 4. This bed feels soft. 5. After tomorrow, Grace will be a college graduate. 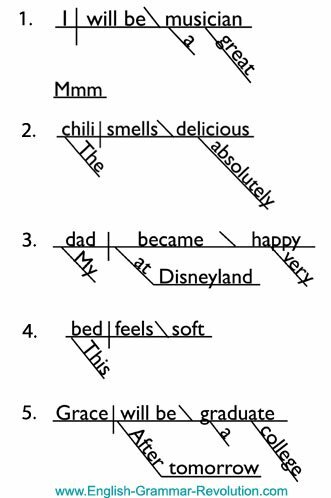 Get these answers in the Sentence Diagramming Exercises book. Get your hands on these exercises! Get these answers in the ebook! My son just started diagramming sentences. He really enjoys it and says that grammar is now his favorite subject. Thank you for inspiring me and my son. I love your enthusiasm for this subject! Finished Chapter 7: Diagramming Verb Types? Move on to Chapter 8.